Beston sorting machine has the ability to separate waste glass from urban garbage. The solid waste mainly includes plastics, ceramics, stones, porcelain, metal, organic impurities, cork, paper etc. Eventually we will get about 3% glass that can be reused. Beston glass sorter adopts control in the whole process of operation, using programmable controller to collect signal from every sensor and convey them into output control contractor and intermediate relay to control three-phase power equipment. Input and output changes on operation, stop and breakdown will be presented directly. 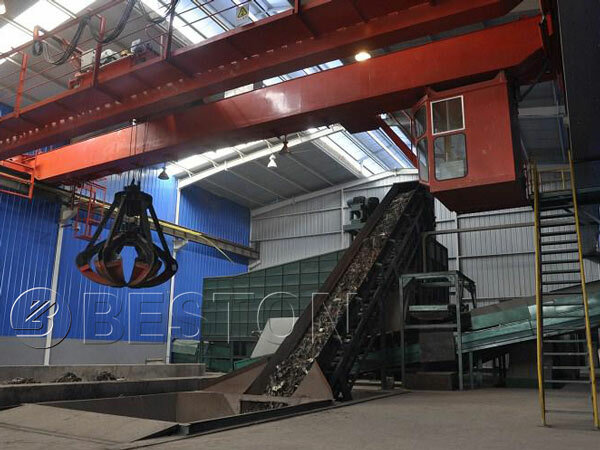 The working principle of glass recycling sorting equipment is integrated separation method of crushing, proportion, the volume, cyclone separation, bouncing separation, and magnetic separation. Equipped with manual auto switcher and crash-stop device for every parts of the system, locates in easy operation position, which will avoid error starting or electrocution. 1. All materials can be recycled, and reduce the amount of waste incineration and the amount of waste gas by the advanced urban waste sorting equipment. 2. Separation of high purity, to avoid the not complete separation of artificial separation, which may damage the equipment of next process. 3. Separate large garbage and sand in one-time separation, while the function of broken bags and uniform feeding. 4. Main equipment is patented devices, which are invented by years of field experience. So the failure rate is low, use of effective. 1. Based on our customers’ site and budget, our experts will design efficient, reliable installation drawings. 2. Engineer (1 person) onsite service, for installation guiding, operation shift training, commissioning. 4. Buyer cover cost on flight tickets, board and lodging, transportation, communication regarding to engineer onsite service.